The lap size quilt is approximately 58" x "68. The price includes thread, backing, batting if needed, binding, quilting and construction of quilt. You just supply the t-shirts/source materials and we do the rest! We will discuss with you what you'd like and/or make suggestions if you're not sure. Either way you will end up with a gift you will love! The starting price for the lap size quilt complete is $500. If you are not able to come into the store or live too far away, you can order your quilt to be done online. Place your order with your deposit and then mail the materials to us at 121 W. Plant St, Winter Garden, FL 34787. 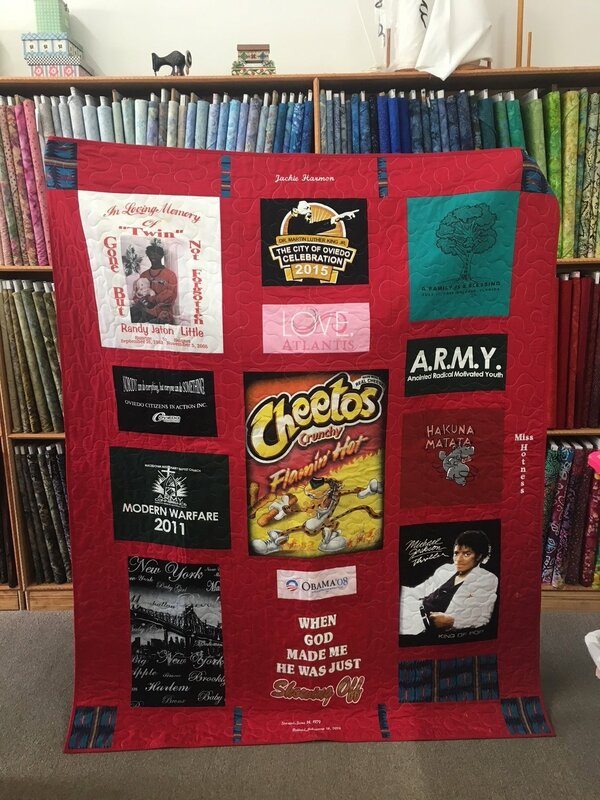 One of our quilting experts will call or message with you to finalize your project order with balance quote as well as turnaround time and any other details you'd like to discuss. We look forward to working on your memory quilt!